I know not everyone likes gorgonzola cheese, so you could substitute any other creamy cheese for it in this recipe. But, it is my favorite cheese. I love to make sauces with it because it melts so beautifully. This is a very easy recipe I found on myrecipes.com. I used last weeks cherry tomatoes for this dish. Recipe: 4 oz uncooked ziti, I used penne, 1/2 tsp olive oil, 1 c. cherry tomatoes, halved, 1/4 tsp salt, I didn’t add this, 1/8 tsp red pepper, 1 garlic clove minced, 6 tbsp half & half, 3 tbsp gorgonzola cheese, crumbled, 1 c spinach. (I doubled the recipe for leftovers). Cook pasta, drain & set aside. Heat olive oil in a large skillet over med heat. Add tomatoes, salt, red pepper and minced garlic. Cook one minute. Stir in 1/2 & 1/2, & cheese, cook 2 min, stirring constantly. Stir in spinach and cooked pasta. Tossing occasionally. Delicious! This entry was posted in Dinner, Lunch on September 12, 2011 by andrewsbeth. 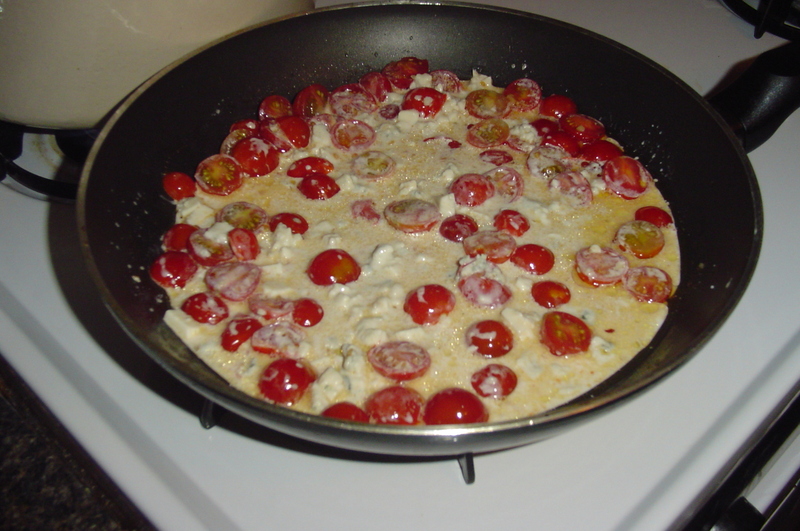 Beth – you do such great things with cherry tomatoes. They still remain probably my biggest challenge in our CSA allocation each week. I don’t know if I can talk Jeff into gorgonzola, though. (Nor is it really my favorite.) But it does look delicious. By the way, why does the spell-checked on this site flag gorgonzola? That is the right spelling, isn’t it?! (That was how it was spelled in the recipe.) I know, the cherry tomatoes can be challenging. Good thing I love them!